At this time of year my thoughts turn to baked apples. In Devon, I used to have my own Bramley Apple tree so I enjoyed a profusion of cooking apples that lasted until spring each year. Here in London, I walk down to the Borough Market to buy a crate of them for around twenty pounds. Then I stumble back to Spitalfields through the City with it on my shoulders, to arrive home with sore arms. On Saturday afternoon, I made the mistake of putting the large white box down to rest for a moment on the low stone wall outside the Gherkin. Immediately, three security guards clutching radiophones and fearful of terrorist bombers, ran towards me from inside the building. 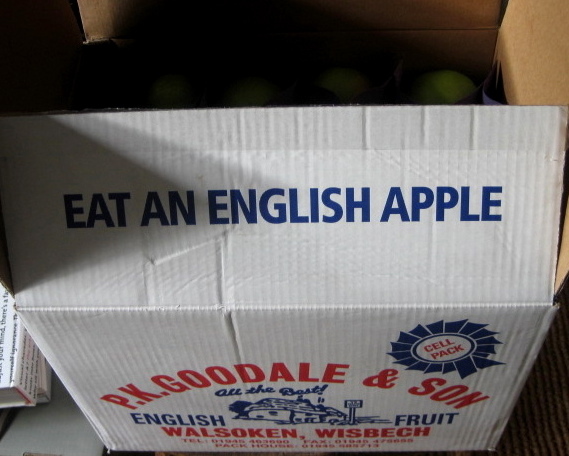 So I picked up my precious box of apples and moved on swiftly. Overnight, a crate of apples will fill the house with an evocative fragrance that distinguishes this exact moment in the year for me. Baked apples are delicious served up with honey and cream or yoghurt. Eaten by the fireside on a frosty winter’s night (accompanied maybe with a nip of Macallan or Laphroaig), they are the perfect restorative for any soul challenged with dread at the expanse of cold nights ahead before spring. I keep an apple corer stowed in the back of a drawer and once the cores are out, I stuff the apples with raisins, add a few cloves and put them in the oven on a baking tray. Cook them at a low heat for about forty minutes, but do not be tempted to think you can get your baked apples quicker by putting them in at a higher heat, otherwise they will explode – just as those security guards at the Gherkin feared. Mmm, baked apples, such a glorious treat ..
.. and the cream, by choice, should be clotted from Devon, thick and creamy with a wonderful crust, served generously from a large tray. Maybe Spitalfields can provide this, it seems to have everything there.